2nd & 4th Tuesday - 6:30 P.M. 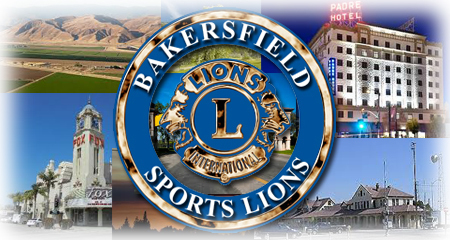 The Bakersfield Sports Lions meet on the 2nd and 4th Tuesday evening of each month. Board Meeting is on the 2nd Tuesday with the location determined every month. Dinner meetings (4th Tuesday) begin at 6:30 at Senior Pepe’s at 8450 Granite Falls Dr Bakersfield, CA 93312. The Bakersfield Sports Lions Club was chartered on September 9th 1991. The Bakersfield Pioneer Lions Club was the club sponsor with Lion Sandra Barabe serving as the Guiding Lion. Since the club had been formed, it has accomplished many things and made many contributions to the community and Lionism in general. The Bakersfield Sports Lions Club is small but it is one of the most active clubs in the district. Giving back to the community – that is what Lionism is all about. We do all of this while having fun and developing a great sense of camaraderie. If you believe that you would like to give more to your community and are looking for an avenue of service, we would love you to join our club.